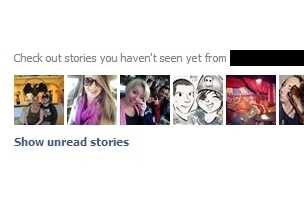 Facebook Testing ‘Show Unread Stories’ Feature? Facebook appears to be testing a way to appease users who feel that they are missing stories from friends in their News Feeds. An AllFacebook reader shared the screenshot above, in which the user was encouraged to “Check out stories you haven’t seen” from one highlighted friend and 39 others, and a “Show unread stories” link was included at the bottom, under the profile pictures of some of the friends on the list.